That’s a very good point. Of course, what I mean by “untranslatable” is that these words do not have any direct translation (i.e. direct single word counterpart). 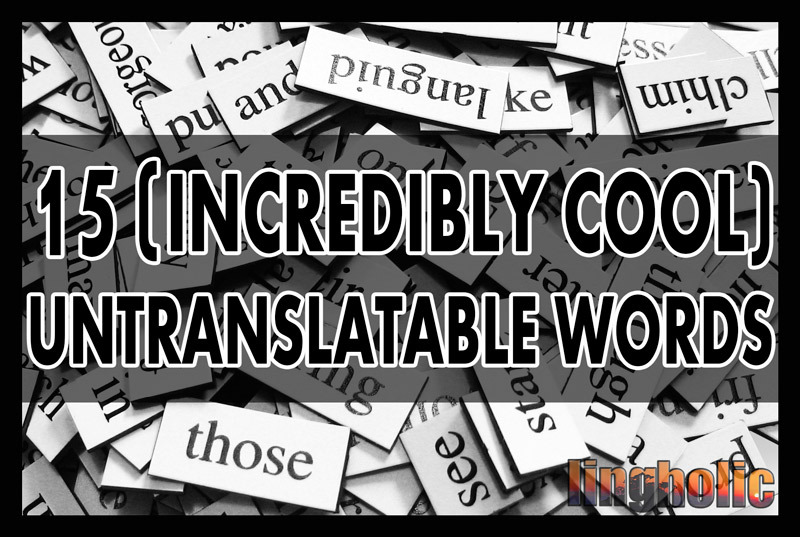 But it’s cooler (and shorter) to have “untranslatable” in the title. But I am in fact really curious about this: have any of you actually come across a word in a foreign language that you thought simply couldn’t be translated? Maybe a concept or a word that you just need to have had the experience of in order to understand? If you know of any such word/concept, it’d be awesome if you could share it with us in the comments below. For more on untranslatability, check out this Wikipedia’s entry. And before jumping to the meat of the subject, there’s a really cool book that has inspired this post (and for which you will see a few illustrations in this post), entitled “Lost in Translation: An Illustrated Compendium of Untranslatable Words from Around the World.” It’s an awesome book with really pretty pictures. This would make a pretty cool gift to any language lover out there! Well, you gotta start with the classics, right? Probably one of the most famous (and beautiful) Portuguese words, Saudade refers to the feeling of longing for something or someone that you love and which is lost. 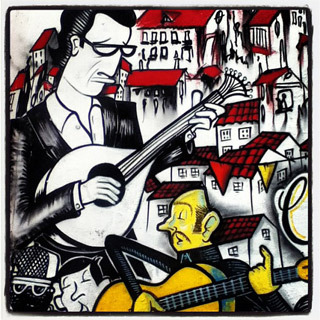 Fado music, a form of music characterized by mournful tunes and lyrics, relates to saudade. This Kimbundu word, used in Angola, refer to a heavy mist or drizzle that occurs in the Congo basin area, often accompanied by onshore winds. It is synonymous for the cool season, and apparently, for the locals there is no translation possible. Upon hearing the word, Angolans would just think about the fresh air, the summer, the cool weather and the very cold water. This useful German word is used to denote someone who is slowing things down by being fussy. It means an additional request which turns a simple delivery/operation/undertaking into a complicated one, often with only a marginal benefit and a sense of it being an unnecessary complication. Hiraeth is Welsh and refers to a particular type of longing for the homeland or the romanticised past. The Japanese word “natsukashii” means something similar. It sometimes has connotations of nostalgia for an idealized past that never was. 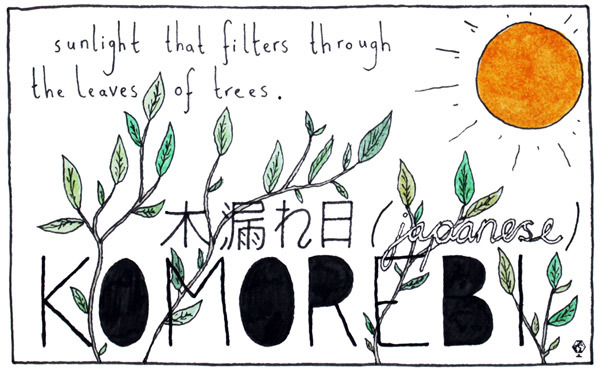 A beautiful Japanese words that refers to the sunlight that filters through the leaves of trees. I love taking pictures of komorebi. The next time your girlfriend asks you “Don’t you think I’m pretty in my new dress?” you’ll get an instinctive feel for the meaning of this word. Dapjeongneo (답정너) is a recently created Korean word used when somebody (usually, you may have guessed, a woman) has already decided the answer they want to hear, and all is left for you to do is to utter that answer to her. Waldeinsamkeit is German for “a feeling of solitude, being alone in the woods and a connectedness to nature.” Perhaps not the most useful word out there, and to be fair it’s a very old term that nobody uses nowadays, but it’s still pretty cool and would make you look very smart if you were to throw it in a discussion, and mention that Ralph Waldo Emerson even wrote a whole poem about it. A word that’s in every French-speaking traveler’s vocabulary, it doesn’t translate to “homesick”, but rather refers to the feeling that comes from not being in one’s home country—of being a foreigner, or an immigrant, of being somewhat displaced from your origin. Literally translated in English it would be something like “unlandscaped” (in fact it has an exact Italian translation, “spaesamento”). If can have a positive connotation, a “change of scene” that you experience when being in a completely new place. 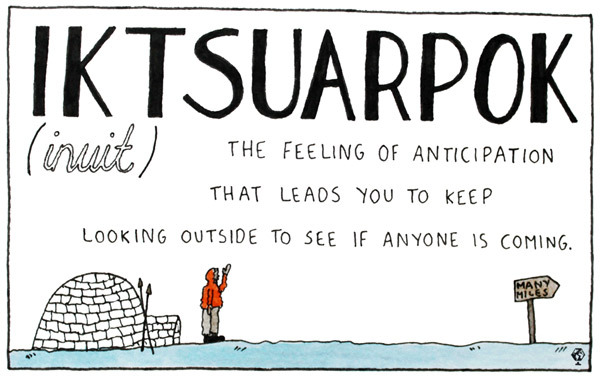 Iktsuarpok is Inuit for the feeling of anticipation that leads you to go outside and check if anyone is coming. It also denotes impatience. Imagine yourself living in an igloo in the middle of the northern tundra, where not a single living soul lives within 100 square kilometers: then I’m sure you’ll get iktsuarpok sooner than later. Obviously people who live in some of the more populated areas of the globe would’ve probably never come up with this kind of word. It’s interesting to see how one’s environment clearly influences the creation of words. I challenge you to beat this jayus in the comments section below. Mamihlapinatapei is an amazing word in Yagan, an indigenous language of Tierra del Fuego (an archipelago off the southernmost tip of the South American mainland, across the Strait of Magellan). It means the wordless, yet meaningful look shared by two people who both desire to initiate something but are both reluctant to start. Pretty cool, uh? Eomchina (엄친아) is a hilarious Korean word that is a contraction of the phrase “Mom’s friend’s son” (엄마친구아들). 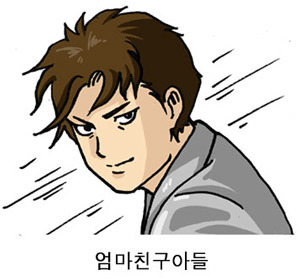 Korean mothers are often very competitive and compare their children against the offspring of their friends. This word is used to describe a person who is more successful or skilled than you – the kind of person your mother would compare you to in a negative light so as to motivate you to study harder. I started this list with a classic, and I thought I’d end with another one. This famous German word literally means “harm-joy,” and refers to the feeling of joy or pleasure when one sees another fail or suffer misfortune. 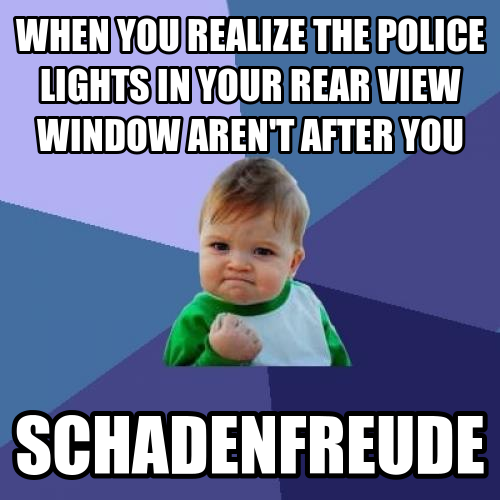 The philosopher Arthur Schopenhauer mentioned schadenfreude as “the most evil sin of human feeling.” A number of interesting scientific studies of schadenfreude were undertaken in recent years. Are you planning on incorporating any of those 15 words into your vocabulary any time soon? And what about English words that don’t have any translation in other languages? Try Gongoozle for one. Great list :). But isn’t melancholy the translation of saudade? I wish there were “stuff” and “get” in Russian. Yes, I agree that “stuff” is a really, really useful word, not always found in other languages. BRILLIANT POST!!!! THIS is WHY we learn LANGUAGES!! I like how you go, “Even though these are translatable, I’m still gonna use the word “untranslatable” despite the fact that this is patently false. The literal translation of “dépaysement” is more like “uncountried” (landscape → paysage but here the root is “pays” → country). The closest translation is probably a change of scenery (used in the fitting context of course). Hi! Spanish speakers tend to use “te quiero” to express that they care about or have a special feeling for someone, It does not necessary express “love” because it can be used for friends, for animals, for coworkers, etc. The problem is that in English they only have the verb “to love” so English speakers do not understand the “level” of the word or the feeling when a Spanish speaker tells “I love you”. Sometimes this can lead to a misunderstanding in some relationships. I think I understand the concept. In English the lower levels of affection are I like and then, especially in relationships, when you would say te quiero we would say nothing which often times makes the first declaration of “I love you” more significant because it’s a conscious act. I would donate the Spanish word “tramite” to the collection. Its literal meaning is “due process”, as in the amazingly multitudinous bureaucratic steps required to do anything in the part of the world blighted by Iberia’s bureaucratic legacy. However, no English translation can convey the horror, nay, trauma, inherent in the process. I would call number three being pedantic, a pendanticist if you want a direct translation. I guess we have a different understanding of the meaning of the word ”pedantic”, but to me it certainly doesn’t mean ”slowing things down by being fussy”. I would also add a Polish word “Żal /ʒal/,” which refers to feeling upset or you use it when you feel sorry that something is/isn’t happening, just like when you were saying in English “It’s a pity that…”. At the same time you can have “żal” to someone if they have betrayed you in any way. It’s pretty complicated, but Mary Besemeres explains it well in her paper “Between Zal and Emotional Blackmail”. In my first language (Bengali), there is a word pronounced “O-bhi-maan”. I have heard that it cannot be translated in any other language because there is no word for it. It means a certain state of mind that you have out of sadness caused by a second person, and leads you to behave in a way that you keep on dropping hints to the second person and expect them to understand why you are upset, instead of confronting them directly with it. It might also lead you to complain about the matter to a third person, hoping that the third person will (in your absence) talk about the matter to the second person and let them know you are upset about it. Although, this is one kind of passive-aggressive behavior, there is no word in any language for the state of mind that leads you to behave in this particular passive-aggressive manner. (Those of you who speak Hindi, a language close to Bengali, shouldn’t confuse this with the Hindi word “Avimaan”, which sounds close to Obhimaan, but means something different as far as I know). The lawn. I was just kidding about the wheels part. I also remember trying to explain “stuff” to a Frenchman. It became a joke between us when he would say, “is this a stuff?” And he had a present for me as he was leaving the US, so of course I had to ask him if it was a stuff. “Lagom” should be on the list. It’s Swedish and is an adjective describing something as not too much, not too little, but perfect, though perfect in an unglamourous and rather boring way. Hi, I am German. Never ever heard anybody say (or write) Extrawunsch. What we DO say though is Extrawurst (special sausage) in the idiomatic use like “Er will immer eine Extrawurst gebraten kriegen” (lit. He always wants a special sausage to be fried for him. = idiom. He always wants special treatment / stuff to be handled in a special way for him). “Hygge” is missing from this list. It’s a danish word that would probably be translated to “enjoying yourself” or “enjoying ourselves.” It can be when you are with your family, just having a good time, or when you curl up with a book and a cup of tea. It’s this feeling of peace and happiness. 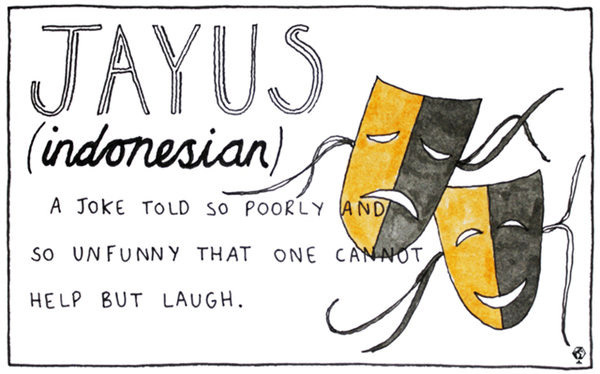 Jayus is not a word referring to the joke, it’s the word you use when you’re reacting to the unfunny joke. Person A: Two antennas met on a roof, fell in love and got married. The ceremony wasn’t much, but the reception was excellent.